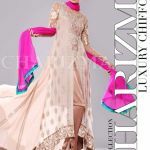 Charizma fashion brand presents its most recent range of luxury chiffon collected 2014-15 for women and girls. Charizma winter chiffon collection 2014 has been presented distinctively for the fall winter cool season. The dresses comprise beautiful range of luxury chiffon dresses to make the women look complete in upcoming winter season. All dresses are intended as per the latest fashion trends or latest stitching styles. Charizma chiffon collection of 2014 consists of chiffon long shirt dresses with the combination of trousers and dupattas. All long shirts bedecked with gorgeous embroidery patterns and sharp print shades which includes natural cool color like pink, purple, yellow, orange, blue, red, black, parrot and brown. These all colors are looking good when women wears this on winter season. Enhances the look and appearance of every women who wears Charizma winter range on this season. We suggest to every women, must try this collection by Charizma on this winter season and enjoy the finest quality fabric with diverse color shades. Charizma, the most famous clothing brand in Pakistan uses a superior quality and pure chiffon textile material. Its dazzling colors and fabrics are unsurpassed to allow these chiffon collections added good-looking. These chiffon dresses are just right for contemporary women and young girls. Still the established grown-up women can also try this collection on winter season parties and families function, perfect dresses for party wear, casual wear and formal wear. The price range of this collection is between 7500 to 8500 PKR (Pakistani rupees). The collection is ready for sale at all leading stores all over Pakistan and Charizma by Riaz Arts flagship stores nationwide. See below here Charizma by Riaz Arts latest Winter Luxury Chiffon Collection 2015 for women and girls. Lets see below here full magazine catalogue design pictures of Charizma fashion brand.